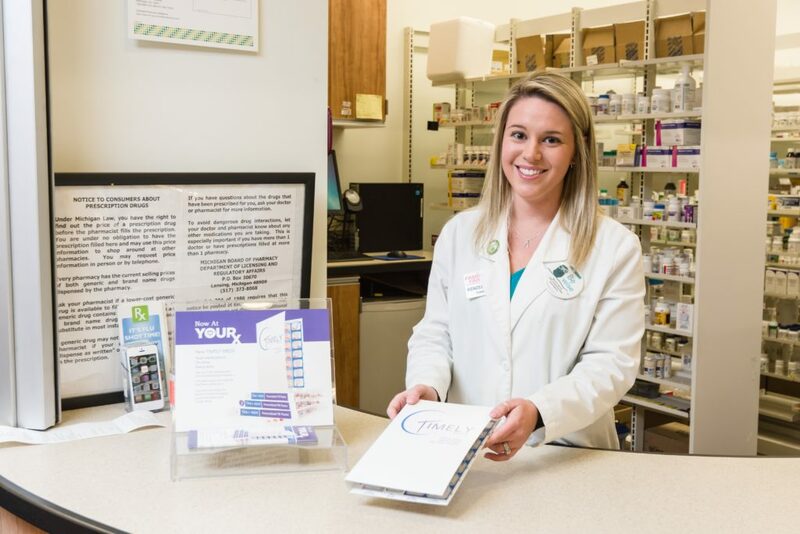 GRAND RAPIDS, Mich. – To make taking multiple medications easier and more organized, SpartanNash will begin offering a first-of-its-kind pharmacy service at each of its 61 Michigan pharmacies. The Timely Meds™ service – with a 28-day set of personalized pill punch packs – will be offered at D&W Fresh Market, Family Fare Supermarkets, Forest Hills Foods and VG’s stores throughout the state, beginning Sunday, May 6. Initially, the Timely Meds packaging service will be available to customers who have five medications or more. Customers can also include over the counter medications and vitamins in their Timely Meds pill punch packs, provided they are prescribed by their physician. There is no additional charge for the Timely Meds service, just the cost of the medications that go into the pre-dosed pill punch packs. The Timely Meds personalized pill punch pack provides a four-week supply of medications, with compartments for morning, noon, evening and bedtime. Every 28 days, SpartanNash pharmacists contact the customer to verify no changes have been made in their medications. If adjustments are needed, pharmacists will work directly with the customer’s physician and insurance company to update the Timely Meds pill punch pack, checking for drug interactions and other safeguards. To enroll in the free service, customers can visit any of the 61 SpartanNash stores in Michigan that offer pharmacy services, including Family Fare Supermarkets, D&W Fresh Market, Forest Hills Foods and VG’s Grocery stores. There, they’ll consult with their pharmacist to monitor medications and organize prescriptions. According to the Journal of the American Medical Association, those who use personalized pill packs to administer their medication are more than 90 percent adherent in taking their medications on time and as prescribed. Those who take their medications directly out of the bottle are only 65 percent adherent.